This antibody is specific for the GABA A Receptor a1 subunit. , corresponding to N terminal amino acids 1-15 of the mature Rat GABA A Receptor alpha 1 containing a cysteine at the C terminus for linkage to a carrier protein. Our Abpromise guarantee covers the use of ab33299 in the following tested applications. WB 1/10000. Predicted molecular weight: 52 kDa. IP Use at an assay dependent concentration. 5ul immunoprecipitates the GABA A Receptor a1 subunit in rat brain microsomal preparation RIPA lysate. IHC-Fr Use at an assay dependent concentration. Note: use 4% para glutaraldehyde fixed frozen sections permeabilized with Triton X100. Defects in GABRA1 are the cause of childhood absence epilepsy type 4 (ECA4) [MIM:611136]. A subtype of idiopathic generalized epilepsy characterized by onset at age 6-7 years, frequent absence seizures (several per day) and bilateral, synchronous, symmetric 3-Hz spike waves on EEG. During adolescence, tonic-clonic and myoclonic seizures may develop. Absence seizures may either remit or persist into adulthood. Defects in GABRA1 are the cause of juvenile myoclonic epilepsy type 5 (EJM5) [MIM:611136]. A subtype of idiopathic generalized epilepsy. Patients have afebrile seizures only, with onset in adolescence (rather than in childhood) and myoclonic jerks which usually occur after awakening and are triggered by sleep deprivation and fatigue. Belongs to the ligand-gated ion channel (TC 1.A.9) family. Gamma-aminobutyric acid receptor (TC 1.A.9.5) subfamily. GABRA1 sub-subfamily. Cell junction > synapse > postsynaptic cell membrane. Cell membrane. 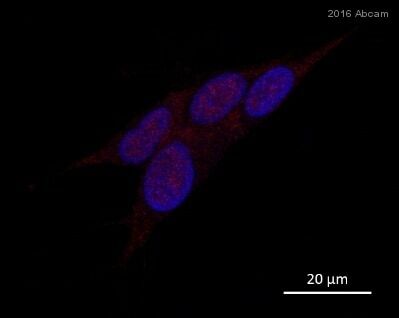 Proteins were visualized using an IgG (HRP) donkey anti-rabbit and a chemiluminescence detection system. 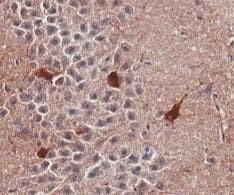 Immunohistochemistry analysis of formalin fixed paraffin embedded rat hippocampus tissue prepared using heat-induced epitope retrieval (HIER) labeling GABA A Receptor alpha 1 using ab33299 at 1/500 dilution. Secondary antibody was an anti-rabbit antibody and HRP-DAB. 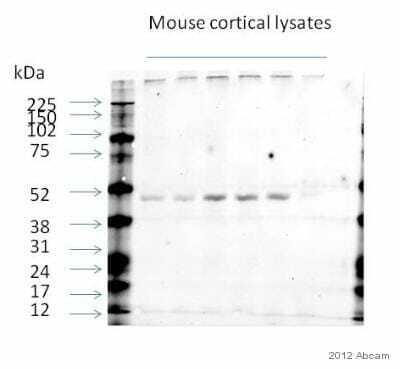 Immunohistochemistry (Frozen sections) - Anti-GABA A Receptor alpha 1 antibody (ab33299)Image courtesy of an anonymous Abreview. 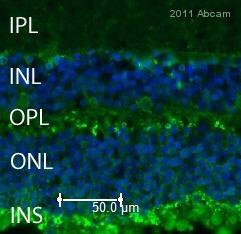 ab33299 staining GABA A Receptor alpha 1 in human retinal tissue by Immunohistochemistry (Frozen sections). Tissue was fixed with 4% paraformaldehyde, blocked with 10% donkey serum for 20 minutes at 24°C, then incubated with ab33299 at a 1/100 dilution for 16 hours at 4°C. The secondary antibody used was an Alexa-Fluor 488 (green) conjugated donkey anti-rabbit polyclonal, used at a 1/1000 dilution. Counterstained with Hoechst 33258 (blue). Publishing research using ab33299? Please let us know so that we can cite the reference in this datasheet.